The Chevrolet Traverse is a seven/eight seat full-size crossrover SUV built on the GM Lambda Platform that underpins the Buick Enclave, GMC Acaida and Saturn Outlook. The Traverse was built in Spring Hill, Tennessee from its introduction until late 2009, when production was moved to the same Delta Township Assembly plant that produces the other Lambda-platform crossovers as a replacement for the Saturn Outlook because of GM phasing out the Saturn brand. Shortly after the production shift to Lansing, the GM badges were removed from the front doors. 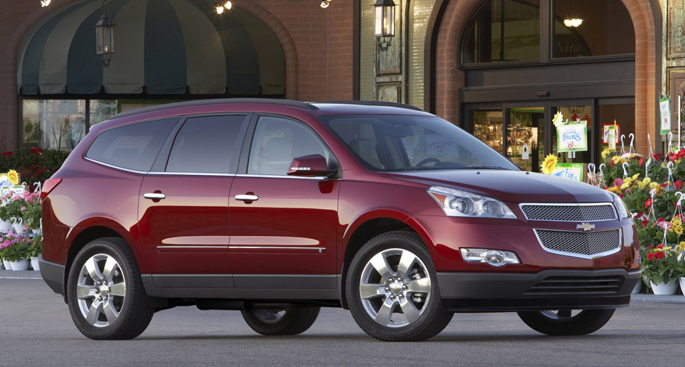 The 2009 Chevrolet Traverse debuted at the 2008 Chicago Auto Show and arrived at dealerships in October 2008. On the road, the Traverse is surprisingly nimble. It handles more like a family sedan than like a big SUV. The steering is direct and responsive, if light, and the brakes are easy to modulate. The ride is comfortable and much more stable than that of large SUVs, which can often bound and lean. The Traverse is large, though, so it can be bulky in parking lot and parallel parking maneuvers. The Traverse comes with a 3.6-liter V6 that moves it ably from a stop and provides decent passing punch. It makes 281 horsepower, or 288 with the available dual exhaust system. 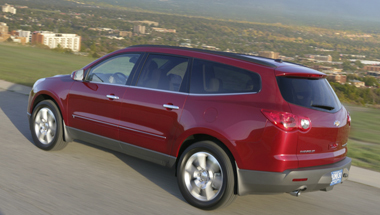 The Traverse comes standard with a smooth-shifting six-speed automatic transmission. Fuel economy numbers are better than those of most truck-type SUVs, but they're less than for the average family car. Given the Traverse's spacious interior and eight-passenger capacity, the fuel economy is quite good. Though no lightweight, the Traverse is significantly lighter than the Tahoe, allowing the Traverse to deliver superior fuel economy and handling. The Chevy Traverse Accessories fulfill the vehicle's appearance. Cloth or leather, the front seats are comfortable and supportive. Room in the first and second rows is plentiful, and the third row is bigger than most seats. The dash kit is attractive, but there's more obvious plastic inside. 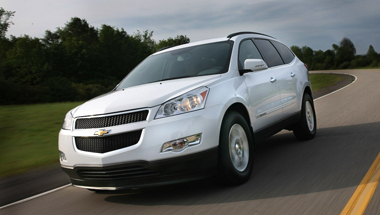 Up front, the Traverse features an attractive version of Chevrolet's split grille. The headlights start next to the grille and wrap around the front fenders. A black air dam below the car grille gives the front end a dark lower face. A peak at the center of the hood continues down through the grille and fascia, adding a touch of character. Getting in and out is easy because the Traverse sits lower than traditional truck-based SUVs. Still, the driver is perched higher than in a car and therefore has a clear view of the road ahead. Visibility to the front is generally good, but the Traverse is bigger than it feels, so it can be tough to see over the driver's right shoulder and objects immediately behind might be hidden from view. With this in mind, it makes sense to get the rearview camera. It proves to be highly useful in everyday parking situations, making maneuvering in tight quarters easier and quicker. The center stack features a navigation screen or the radio, plus the climate controls. All of the controls are clearly marked and easy to reach. The radio has an audio input jack but no iPod interface. There is plenty of storage for small items throughout the cabin. The front center console has a deep bin on the bottom and another shallow bin on top. The top section slides forward and back to act as an adjustable armrest. There are cup and bottle holders galore, including two on the center console, one in each front door, and two in each rear door.